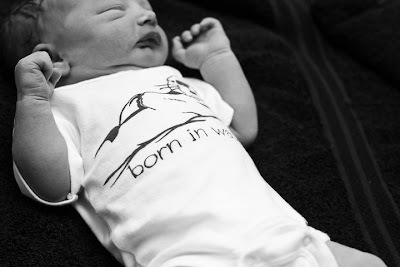 A rockin' home birth story- I love how she talks about her noises. Women need to know that vocalization is a normal and helpful part of birth! Growing up, I was never afraid of the idea of pregnancy and birth, only fascinated. My mom had eight children, and I was the second one, so I grew up surrounded by my younger siblings. I remember my mom being pregnant, and hearing her laboring in the middle of the night before my dad took her to the hospital. (I think she would have been more quiet if she knew I was listening.) I remember thinking, "Hooray! We are going to have a little baby soon! ", and I fell asleep again. My mom is a confident, strong woman, and she knew how to give birth! She even delivered one of their babies herself, in the front seat of an SUV! She always wanted a home birth, but my dad wasn't comfortable with the idea. When I grew up and married, I always knew that if I ever had a baby I would have it at home with a midwife. My husband felt very differently-he wanted us to have the baby in the hospital. When we got pregnant, we were ecstatic. I was eager to meet our little baby, but I felt terrible every time I thought about possibly having to go to the hospital to have it. I am very uncomfortable in hospitals, and the sight of needles makes me hyperventilate! So I set out to change my man's mind. (Hehe) I read piles of books on birth, talked to all the women I could about birth, and watched "The Business of Being Born" with my hubby...and eventually with all the research and information, he was completely supportive of me giving birth at home. Whew. I loved being pregnant...I loved looking forward to holding my baby, I loved how she kicked me, and I loved to see my body change. It's amazing! I read and read about giving birth and I couldn't wait for everything to happen! Neither could my husband...he spent the last few weeks of my pregnancy in anxious impatience. He would call me every half hour to ask if I had any contractions yet, and tell me to bounce on my exercise ball. When he was home, he would massage my feet. (He read somewhere that it can trigger labor.) I love a good foot massage as much as the next lady, but after a few weeks of him trying to get my labor started, it was beginning to get on my nerves! I even went on a hayride on a bumpy wagon to try to jump start my labor...no luck! Not even climbing up the wagon and jumping into it (while my husband ran for a ladder) helped. I had a lot of Braxton-Hicks contractions, sometimes all day long, but they would always go away again. The BH contractions began to come more often when I was about 37 weeks along, and I would wonder if this time would be the real thing. Four days before my due date, I had bloody show, and I mentioned it excitedly to my midwife when I went in for an appointment. She told me labor could begin tonight, or it could begin in a few days. She said I would probably have the baby by the weekend. I was so excited! Too bad she was wrong. :) The weekend, and my due date came and went without any action. That did it. I wasn't going to wait around any longer. That Monday, I went with my husband for a day in his big truck at work. He hauled storage sheds and gazebos at the time.) We drove all day in that bumpy truck. By the time the day was over, I could feel the baby's head bumping down on my cervix with every pothole we hit. I was beginning to be uncomfortable, and I was thankful when we got home. That night I had more BH contractions, or so I thought. They continued all night, very weak, and I was able to sleep very well through them. The next morning I had a few weak contractions. They kept coming all morning until lunchtime. I sewed a tote bag and checked my email and such, and called some friends and waited for my Braxton-Hicks to go away. They didn't...and they began to get stronger and come more often. Just for the fun of it, I began to chart my contractions. They were all over the place, some were 5 minutes apart, and some were up to 10. They didn't hurt at all, and I remember thinking that it couldn't be real labor because it didn't hurt! Everyone had told me that I'll know it's real when it hurts and I'm tired and grouchy. Around 2:30, my husband came home from work. I was was trying to take a nap on the sofa, but I was glad to see him home. I needed company by then! He helped me chart contractions for a while, and then I decided to go take a bath. I was beginning to realize that this might be it! It still didn't hurt very much, so I didn't take it seriously. After half and hour in the tub, I was getting restless. I needed to move! I went back downstairs and ate cornflakes (weird hehe). I couldn't sit to eat them, because I had to keep getting up to bend over the table with my contractions. I was having a great time moving with my contractions and listening to my body. It really does tell you what to do! Even though I wasn't in a hurry to call for our midwife, my husband was. He kept asking if it was time to call the nurse yet, so she could check me out. Finally, I thought it wasn't a bad idea, but I was worried that we might be calling her for nothing. My labor was beginning to get stronger and I needed to moan throught the contractions to keep my focus. I was so happy that we were finally going to have our baby! All of a sudden I felt a huge urge to pee and use the bathroom, but I couldn't! I was upset. I couldn't figure out why I couldn't go, and I reeeeeeeeaaaaally had to! (I didn't know it, but the baby's head was coming down.) The nurse showed up right about then and she could see I was having strong contractions. She checked me, and said worriedly, "You are at about 8 or 9 centimeters! I am going to call the midwife...DON'T PUSH!!" I had told her that I felt like I needed to use the bathroom. That poor nurse. She almost couldn't find a midwife to come! Our original midwife was in Haiti for a humanitarian trip, and the back-up ones were at births themselves! Finally, she reached one. I didn't care at that point! I figured that if she needed to, the nurse would deliver the baby. I was using our bed's headboard as a labor support, along with a lot of pillows...ahh. It felt so good to bend over during contractions. They were coming hard and fast now. My doula showed up right when I couldn't handle the contractions anymore. She kept massaging my lower back and holding my hand. My husband joined in, and so did the nurse. I always wondered how I would act during hard labor, and if I would be quiet or loud, and if I would keep my clothes or not. Well, turns out I'm not quiet at all! Everyone kept reminding me to keep my yells quiet and low. It really did feel good to let out the pain through moans. I soon got so warm that I pulled off my nightgown, and all I had on was a tank top. And that's when the midwife walked in. It turned out that I knew her from years ago! That was nice. I felt safe with her. We exchanged 'hellos 'and 'how are you's' and I introduced her to my doula and hubby. I had huge contractions , with almost no pause between. I was getting very tired of this labor thing, and I just wanted to begin pushing. I didn't even realize that I had pushed, but my midwife noticed, and she checked my cervix. As soon as I began pushing for real, my water broke. The fluid was dark brown and green, not what I had expected. Baby had pooped, and the midwife said, "We need to get this baby out fast, or I need to call 911." Everyone told me to push, and I said, "I can't!" I wasn't sure if I could stretch far enough for a BABY to come out! But everyone said, "Yes you can!" They helped me get in position, and my doula reminded me of how to push, and off I went. I thought, "If I tear or not, I am getting this baby OUT!" I pushed as hard as I could. I didn't know it would feel like it did- like I was pooping a bowling ball, and I did not like it. :) I wanted to get it over with. My husband began to say, "I can see the hair, and it's dark!" It was so great to be reminded that there was a baby in there! I was getting somewhere! At one point, I really need to stretch my legs, and I accidentally kicked my poor doula in the head...o my. She forgave me! The midwife asked me to reach down and feel the baby. The head was showing a little big, about 2 inches, and its scalp was all wrinkled together and soft. For a moment I was worried that the baby didn't have a skull. (It did. hehe) Feeling the baby's head was amazing! I forgot about pain and contractions and everything else. I focused on pushing out my baby, and she was coming fast! The midwife told me to pant and to give tiny little pushes. It stung so bad when the head came out, but right after that all the pain went away, and out came the baby. She was tiny and gray, all slippery, and her arms and legs were waving in the air. I couldn't believe I had a baby! All I could think was, "I want to hold her!" She screamed like crazy! The midwife tried to suction her airway out, in case she inhaled meconium, but she couldn't even to that, because baby was cried so hard. I grabbed her. It was so wonderful to hold her and cuddle her. My hubby and I were so excited that we didn't even think to check if it was a boy or a girl. He cut the baby's cord and I held her while I delivered the placenta. My husband finally asked, "Is it a boy or a girl?" It was a girl!! She was beautiful and soft, and I kept kissing her! When my husband said hello to her, she looked right at her. We were so happy. I kept saying, "It's our baby!" Finally she was here! I was thankful that the birth went so well. I had only been in hard labor for a little over an hour and a half, and I had only pushed for 17 minutes! We didn't sleep very much that night, but it didn't matter. We had our baby with us, and she was absolutely perfect. I am still amazed at how wonderful giving birth was, and I hope that I can experience it again someday!